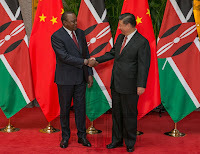 Monday November 5, 2018-Kenyans were up in arms after it emerged President Uhuru Kenyatta was in China once again to engage in bilateral talks over possible business in future. Uhuru is expected to open an avocado export deal during his visit in China where he is set to attend the first China International Import Expo (CIIE). The President also met with Chinese President, Xi Jinping, in Shanghai, a move that has surprised Kenyans, especially since the country’s debt to China is now the third highest in Africa with KSh 980 billion owed to the Asia superpower. “Our talks focused on promoting economic and trade exchange and cooperation between our two countries ahead of the inaugural China International Import Expo (CIIE),” Uhuru said. However, Kenyans took to Twitter to air their honest views on Uhuru’s meeting with Chinese officials and the reactions were nothing short of humorous. They warned Uhuru never to take another loan from China because China may just auction Kenya due to many loans.